To prevent the server wheels from falling into holes or gaps in the floor, always use a 3/16-inch (4.8-mm) thick A36 metal plate with beveled edges to cross these gaps. The plate must be wide enough to bridge the gap in the floor. Caution - A metal plate thinner than 3/16 inches (4.8-mm) will not support the weight of the server. A fully-configured server can weigh around 3700 lbs (1678 kg). 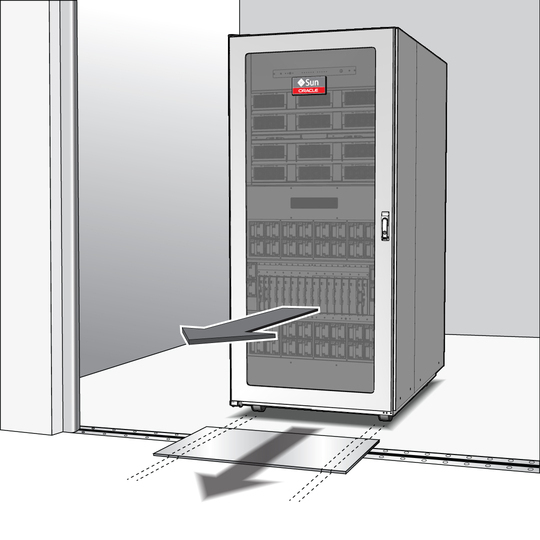 Caution - If the gap the server must cross is wider than 2 inches (51 mm), or has an elevation of greater than 1 inch (25.4 mm), consult with you facilities manager to design and use a metal plate that will bridge the gap while supporting the full weight of the server. Use a 3/16-inch (4.6-mm) thick A36 metal plate with beveled edges when crossing gaps in the floor.